Sashiko originated in Japan as a way to deal with scarce resources, and later evolved into an elegant form of folk craft. From basic stitches that reinforce weak fabrics to elegant personal motifs that express individuality, this art form often evokes a quiet joy and playfulness. In this talk we will learn about the historical and regional background of sashiko, consisting of a primer on basic stitches and materials commonly used, as well as its effect on the cotton trade in Japan. Vintage pieces from the speaker's personal collection will be available to examine. 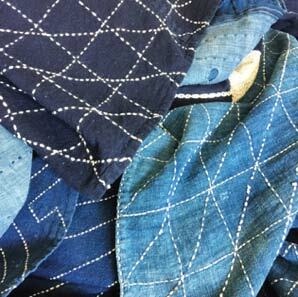 Carol Ziogas is a sashiko teacher, researcher, lecturer, and collector of Japanese textiles. She founded Kimonomomo, an online shop specializing in sashiko and Japanese fabrics and sewing notions. She writes about her trips to Japan at theardentthread.com. Note: Your registration for this event is consent to be photographed or videoed as a participant for SAA publicity purposes.